Has long been overshadowed by Implosion and Darkbomb, but I think it can come into the spotlight in Standard. Been running this in Renolock and having great success, it deals with the very annoying and very prevalent Imp Gang Bosses and Totem Golems, and can be used to finish off 4 health minions. Darkbomb is dead. Long live Shadowbolt! 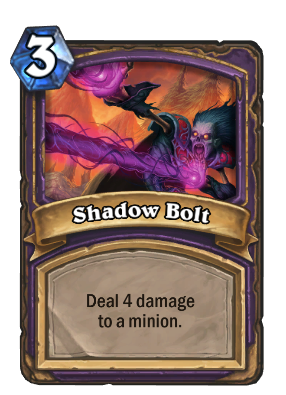 Warlock would be pretty broken if it had good direct damage spells like mage, so it's probably a good thing that this card is underpowered. Kind of embarrassing now that Flamecannon exists. Mage has stronger damage spells by default. Also Flamecannon targets randomly. Love this card. It has won me lots of games in my aggro deck by helping to clear a taunter.